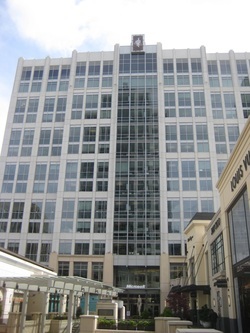 A low-rise retail core is sandwiched between the project’s twin office and residential towers. PL:BECS provided specific recommended configurations for pre-cast concrete exterior wall panels to minimize infiltration risk, and to capture and drain water out of the cladding in case of joint failure. 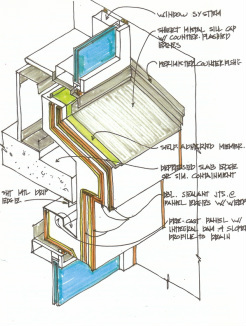 PL:BECS sketches depicting recommended detailing configurations color-coded all materials for optimum clarity. 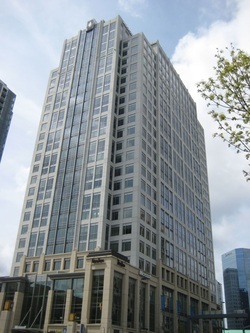 Project Summary: This major development in the heart of Bellevue’s urban core includes a tall tower as well as several lower building portions, and houses residential, retail, and office uses. 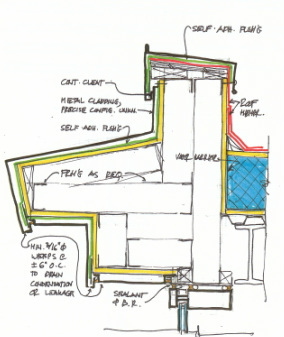 PL:BECS Services: PL:BECS provided initial design assistance, including specific recommendations for all exterior envelope assemblies, as well as initial detailing guidance. Specific recommendations addressed measures for limiting inherent deflection risks of the post-tensioned concrete structure. Complete assembly recommendations were also provided for the sub-grade shot-crete walls, concrete garage floor slabs, elevator pits, and detention vaults, and addressed considerable challenges posed by the building’s base being submerged 40 feet into the site water table. PL:BECS also outlined a range of specific waterproofing assemblies appropriate for the dynamic, post-tensioned plaza decks as well as roof assembly options for the low slope roofs. Infiltration-resistant assemblies were also outlined for concrete block wall systems, and included four different options, ranging from CMU veneers to single-wythe CMU with integrated flashing systems. PL:BECS also provided specific recommendations for configuring the exterior pre-cast concrete cladding to capture and drain any water which may penetrate the outer line of defense and thus avoid interior infiltration. To limit infiltration risk at the innumerable sealant joints sealing the pre-cast concrete perimeters, PL:BECS recommended double-stage, draining sealant joint systems.